That strategy was to blame fans. To serve and protect, eh? If these leaks are true, it's amazing for the families but why have they been forced to suffer for 23 years to hear the truth? Because there were too many vested interests in keeping it hidden. Disgraceful. #HIP "Multiple factors were responsible for the deaths of the 96. The fans were not responsible." Early signs of the evidence this morn are encouraging, but I have to ask how anyone can live with themselves after knowing what they did to cover up the truth. I'd also like to know if the owners are present in Liverpool today for this monumental day? Lets not make this about the owners. Stand by for Bloody Sunday style apology from PM after reading Hillsborough report but will it focus on role of police or politicians? No leaks about Bernard Ingham yet? He can't come out of this unscathed, surely? Guardian also covering today's momentous events. I can assure you I'm not - I just feel very strongly that they should be present today if they understand & respect the history of Lfc. That sits uncomfortably with me, I do hope he isn't wearing that to score some cheap political points. Want this day to be remembered for the right reasons. The owners not being here does not take away anything from today. Or, because they understand and respect the history of LFC, it might be best if they are not present today so that the focus is not on them, but on the families concerned, whilst the owners stay quiet and dignified, and comment at a later date? Exactly the same thought as I had. That's what politicians do. Piggy back onto whatever cause happens to be in the public eye. How vocal has been on this issue in his career to date? Can he not just be a supporter of the fight? Perhaps he has learnt more about it recently and decided to wear it out of support? Anyway, who cares. Its about the Truth today. Nothing else. 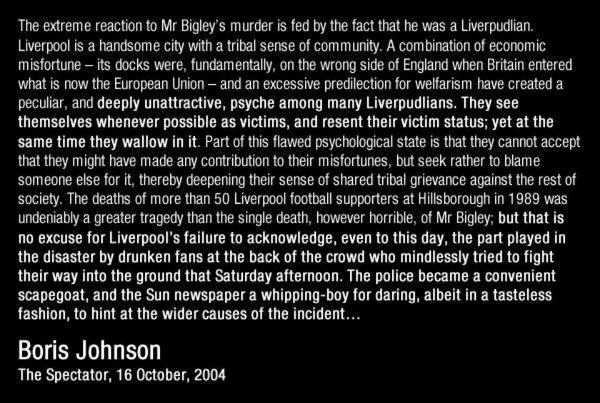 This always makes my blood boil and certainly added fuel to the fire, for those who weren't educated about Hillsborough. TBF, I have seen support from him prior to today. Cameron's statement coming up any minute now. Dr Rogan Taylor from Liverpool University, who chaired the National Football Supporters Association at the time, said that the families just wanted the truth about what had happened: "All those people responsible for staging that match, from the Football Association... to the police policing it, the emergency services who attended it... The simple answer for everybody was: blame the fans. They killed themselves. Well I'm afraid that doesn't work, it doesn't ride, it's not true. I think what we want is the truth." I agree - My wording was wrong it should have said: I just feel very strongly that they should be present in some shape or form today if they understand & respect the history of Lfc. 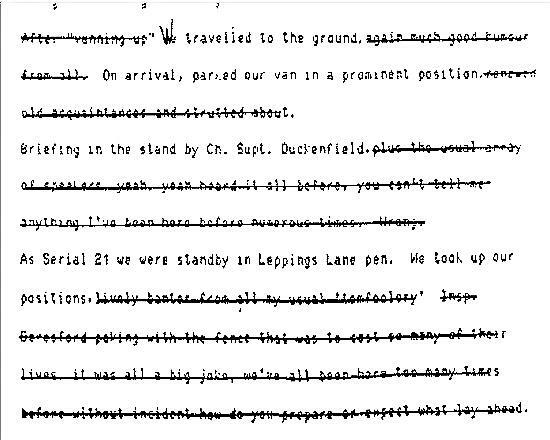 Police changed or deleted 116 of 164 statements by officers to shift blame on to the fans in an orchestrated cover up! Seen tweets from him regarding it previously. It's a political issue. If a cover-up involving police, government and media, among others, isn't a political issue then I don't know what is. Party political - that remains to be seen. Cameron: "Report reveals the shortcomings of ambulance & emergency service response. Rescue attempts held back by leadership failures"
Cameron confirms the cover up. "The families were right"
DC: shortcomings of Ambulance response. 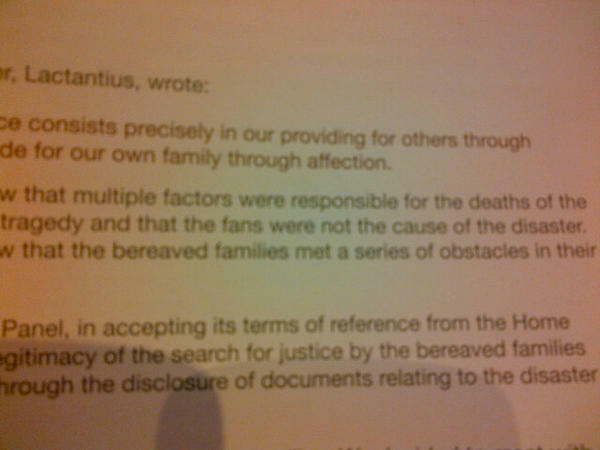 Families long believe there has been an attempt to blame fans, families were right.